My views on colors I don’t love in interiors is included in an article on House Beautiful (also Elle Decor AND Country Living). As with any opinion piece, it’s all subjective. I don’t agree with some of the others interviewed and they may not agree with me. But I did want to share a little about why I think beiges aren’t great in interiors. I put together a quick board of various items in the beige color family. Many think beige (also tan) are neutrals and go with anything. They may go with many other colors, but they don’t always get along with each other. In other words, it’s all about the undertones. There are pink-beiges, yellow-beiges, green-beiges and blue-beiges. And when mixed together, they fight and can bring out the undertones in not so great ways. 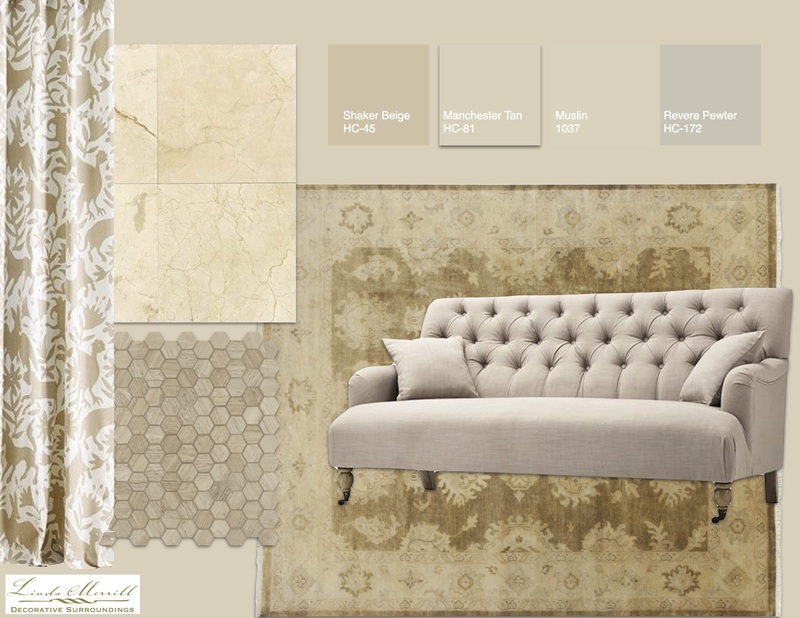 I’ve added as backgrounds some of Benjamin Moore’s most popular tans, beiges and greige colors. First up is Shaker Beige, which is a mid-range beige/tan color. There is a nice depth to it and it complements the rug very well. But to my eye, it makes the yellow in the marble tiles (top left) look way too yellow and makes the sofa look way to blue/gray and cold feeling. It mostly goes with the curtain fabric, though I feel it’s a little too warm a tone for them. Next up is Manchester Tan, which is a cooler tone than Shaker beige – there is a little more blue in it. It clashes with the rug, but works well with the drapery. The marble tile isn’t quite as yellow feeling as it’s bringing out some of the deeper beige tones. But, the sofa now looks a bit pinkish. Muslin is very close to Manchester Tan, but skews a little more green. This is making the tile look very pink and doesn’t go at all with the drapery or the rug. The sofa is back to looking a bit grey. And finally we have Revere Pewter, which is considered a “greige” color – somewhere between beige and gray. To my eye, it’s not too bad with everything except the sofa. 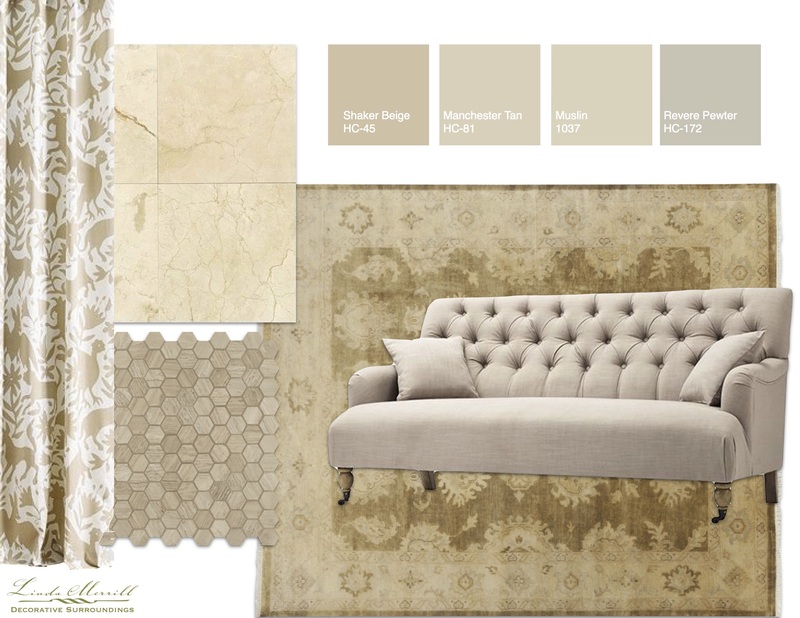 There is a lot of gray in the rug, which is pulled out, as well as the cooler beige in the drapery fabric. For contrast, I’d probably want to see a much darker or much lighter color on the sofa fabric. As for grays, it’s basically the same concept. There are pink-grays, purple-grays, blue-grays, green-grays, and more. They are also, so, so overdone. It’s all about gray these days. It can be incredibly beautiful (see again Axel Vervoordt) but it has to be done right. And it’s not right for every room in every home. So true, Mary Beth. As I’ve said, anything can be beautiful if done correctly. But when everything is gray (as it is these days) just for the sake of fitting in… it gets to be so monotonous! Have a great weekend yourself! I’m not a beige or grey fan either. But if it works for the client, it works. True. But at lease as professionals, we know the pitfalls and can work with the colors well and end up with a beautiful space! Just discovered you and so grateful for this article 🙂 I am a Realtor in the Raleigh area and see SO many homes with grey and beige, its overdone . So what is the next thing? I am hoping for creams and whites…what do you think Miss Linda? Hi Sharon – thank so much for your comment! At the trade shows – KBIS (Kitchen and Bath) and High Point going on now, we’re seeing a lot more color in interiors. It takes a while to translate to the masses, however. I know up here in New England, the realtors say buyers only want the white kitchens and gray walls in turnkey homes. No “fixer uppers” despite the popularity of those tv shows. Go figure! I think it depends on the light in the room, as with any color. I live in San Francisco. Most of the homes that are photographed and are therefore “designed” are facing the Marin Headlands and the Golden Gate Bridge. That is northern light. What I see every single designer here do is paint the room a popular color, which means beige or grey or some form of white. The rooms are so cold, I need a sweater just looking at the photographs! I absolutely do not understand how anyone trained in design would no see the need to warm up those rooms facing north. It is an epidemic here. Amongst other design sadness. Hi Anne – It definitely does depend on the space, no question. Thanks for your comment!